Last week, it was revealed that Amazon lobbied more federal entities than any other American public company in 2018. Given the significant resources brought to bear, its strong popularity among consumers, and the successful public relations-frenzy that drove 238 cities and regions to compete to win the company’s HQ2 throughout most of the year, companies looking to emulate best practices for strengthening their brand’s reputation and standing in the public arena, as well as achieve key business objectives, might look to follow Amazon’s playbook. Shoe-Leather Lobbying Is No Longer Enough: From healthcare to defense to labor regulation, Amazon contacted 40 different federal entities on 21 different general issue areas, spending $14.4 million to do so – second only behind Google parent company Alphabet’s $21 million. 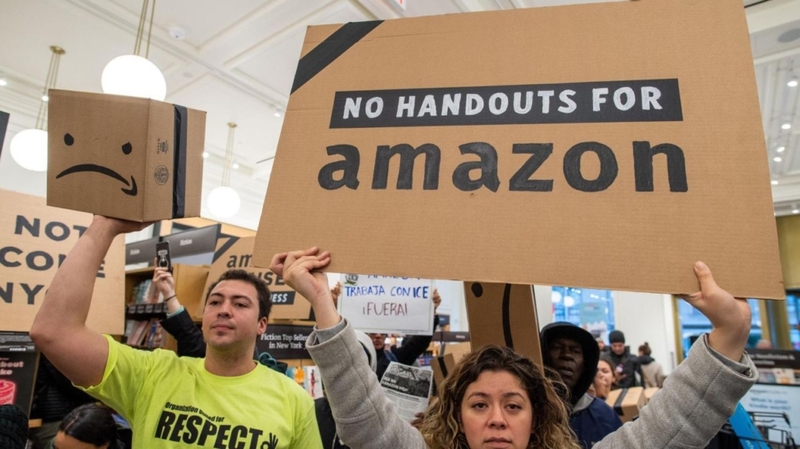 Despite a powerful influence machine in Washington and the support of a majority of New Yorkers, Amazon was criticized “day in and day out” by local politicians who refused to meet with the company and caused it to simply decide that the environment was not one it wanted to work in over the long term. Lobbyists walking the halls of power are no longer enough – instead, companies and other organizations requiring governmental and public support in order to achieve their objectives need new and better tools to combat public pressure driven by even a small minority of activists who can wield outsized influence in the public arena. Evaluate Strategies Through A Lens Of Political Risk: With politicization infusing everything from sportswear to chicken sandwiches, a company or organization’s strategy for achieving its objective must be viewed through a cohesive lens of political risk. This means assessing the political risk relating to a business decision by identifying the range of stakeholders who may engage on the issue, understanding the network of influence and its impact, and leveraging these insights to inform a strategy to overcome challenges and achieve the objective as developments unfold. When done proactively and in advance of key decisions, assessing political risk can prevent wasted time, money, and reputational damage in a futile endeavor. Leverage Opportunities By Having The Best Information: Assessing political risk as part of the due diligence process is not only about avoiding foreseeable public affairs challenges. It can also help identify and leverage opportunities. Analyzing the stakeholders and influencers surrounding a project, objective, or issue can become a force-multiplier for a company or organization, allowing it to focus on reaching out and engaging the constituencies that matter so that their message can be amplified with key decision-makers. Seizing such opportunities, and making the best decisions and identifying the best strategies, requires having the best information. In Amazon’s case, they could have identified political opponents in advance and mobilized the majority of New Yorkers who supported HQ2 in Queens to mitigate that opposition. The New Normal Is Heightened Political Risk: Whether something is good politics or not is an increasingly important consideration for organizations traditionally removed from politics, be they companies, investment firms, or nonprofits. While it is not clear that the public nature of the HQ2 competition was in part responsible for the political risk it attracted, and which ultimately defeated the New York headquarters, political risk has arrived as a crucial factor that must now be taken into account by companies and organizations when making key decisions. In addition to influencing smoke-filled rooms, then, they must now engage too in the fog of the public arena. Your company or organization doesn’t need to be in the throes of a highly-public competition to choose a new headquarters in order to be adapting to political risk. Applying a framework to evaluate key decisions through the lens of political risk before they are made, or even as added due diligence for those that are already in process, can increase the likelihood of anticipating, mitigating, and overcoming the public affairs challenges that are common in today’s operating environment. It appears not even divine intervention can save La Croix. National Beverage Corporation, the maker of sparkling water beverage La Croix, recently announced a 40 percent drop in profits last quarter following an October lawsuit that accused the company of mislabeling its products as “all-natural” and claiming the company’s waters contain a synthetic compound “often found in cockroach insecticide,” among other chemicals. His comments, as well as the company’s financial and legal issues, provide another example of how reputational risks carry real costs and a company’s response can make things better, or in this case, worse. You may think WeWork’s $47 billion valuation stems from its ability to provide shared workspaces for startups across the country. However, over the past year, WeWork has aggressively tried to generate more revenue by collecting and analyzing information about how people move and operate within these shared offices. For example, WeWork recently acquired Teem, which makes software that collects data on conference room bookings, and Euclid, a service that tracks smartphones in retail spaces. It turns out China’s economy may not be so big after all. A new report from the Brookings Institution found that China’s economy is about 12 percent smaller than official figures estimate and its real growth has been overstated by about two percentage points annually. The report has sparked fresh concerns that China’s economic slowdown is more serious than previously acknowledged as the U.S. and China continue to negotiate a trade deal. With a growing population demanding more middle-class privileges, China’s economic challenges may add additional pressures on Chinese President Xi Jinping to make a deal when he meets with President Trump at a summit tentatively planned for late-April. Trust but verify, indeed. As students eagerly pass out catchy political flyers to their campus colleagues, it is easy to dismiss them as student-led movements passionate about a cause. Yet these “grassroots” organizations are often times sophisticated political operations with billionaire backers on both the left and right. One such group, NextGen Rising, masquerades as a youth-led grassroots organizing movement but is in reality a subsidiary of the NextGen Climate Action Committee, a political-action committee formed by billionaire anti-Trump critic Tom Steyer. Rather than provide professional development programs, these groups tend to be far more interested in instilling political ideologies in young college students. Groups like NextGen Rising serve as a reminder of the importance of understanding an organization’s funders in order to know the true motive of a movement.